Flat Tow – Let's Go RVing! Shopping for a Car to Flat Tow is NOT Easy! When we began RVing we did not have a car that would flat tow (four wheels down) so we opted to buy a tow dolly and tow my Toyota Avalon. Until Saturday, April 15 we had never had a problem with it but watching Jerry hook the car to the dolly was tortuous for me. Rain or shine, hot or cold he had to put a tarp on the ground and then crawl under the front of the car to hook the chains and tighten the straps. I had the easy part. I drove the car up on the dolly. It seemed during those first few trips it was always raining when we got ready to hook up. I began to wonder if he could do it in good weather! It also took a few minutes to get it done so if we were leaving from home we’d try to do it the night before because not only was it just a bit time consuming it was hot(or cold), sweaty and dirty work. Hooking up early gave Jerry a chance to shower and put on clean clothes. When leaving a campground we had to either find a designated place to hook/unhook or block the lane. At some campgrounds we had to put the dolly in a location away from the motor home and Jerry didn’t like doing that. In other words towing with a dolly was not fun, however since neither of our cars would flat tow we surely were not going to buy another car. After all we had just bought an RV! We’d make it work and we did for three years. After the dolly and car burned up on April 15 we knew we would have to buy another car and I hate car shopping especially when I have a long list of requirements. One sales person I talked with said to me “Whoa Girl, you’ve got a long list” and she was right. There are only a few cars with automatic transmission that will tow four down and I’m not about to begin shifting gears again at this point. Fortunately as members of FMCA we have access to lists dating back to 1999 of suitable cars and believe or not the cars on the list change from year to year. We knew we didn’t want a new car to tow behind the motor home and possibly get dinged by debris but we also knew this was going to be “my car” and I didn’t want a clunker. So the hunt began. Our first stop was at our local Toyota dealer to talk with our favorite salesman. We knew that Toyota no longer had any manual transmission cars that would flat tow but wanted to know if possibly our Forerunner could be adapted. Possibly it could but not without a lot of modifications that we were not interested in. Toyotas hold their value and we would really like to have stayed with them but was not to be. Our next stop was a dealership that carried Honda, Ford, Jeep, Chevrolet and Buick and possibly some more. We looked but didn’t see anything of interest so we went to another dealership and looked at some more. They had a jeep but when we opened the doors Jerry and I both said “no way”. It smelled horrible. They said they were going to have it fumigated in the next day or so and would call us when they did. They never called. We drove a CRV –EXL but the salesman was clueless about the details of the car. In fact he told us that until last week he thought RV was a motor home and had never heard of a CRV. Maybe he needs some work on his selling tactics. Our friend at the Toyota dealership suggested we try the website “Car Guru” so when we got home we began the search. We finally narrowed it down to either a Jeep Cherokee, Honda CRV, GMA Terrain or Chevrolet Equinox. In addition to using Car Guru I posted on a couple of RV message boards asking for suggestions. The next day we had to go to Durham to the salvage company to sign papers to release the car to the insurance company. When we went in the head guy just looked at us, laughed and said “Yeah, I think it’s totaled”. Gee, you think! We got a few more things out of the car but they smelled so badly that they’ll probably be thrown away. Our next stop was a CarMax lot in Raleigh. Boy, they have a lot of cars. We looked around for a bit, eliminated some cars due to weight (we needed to stay with a car that weighed about 4,000 pounds) and then some I just didn’t like for various reasons. We found one CRV that we kind of liked and we test drove it. Our next stop was the other CarMax in Raleigh, a smaller lot but it had a pretty bright red jeep. Being a NC State fan Jerry has always wanted a red vehicle. Actually he wanted a truck but life is about compromise. We drove the jeep and liked it a lot but we asked the salesman if it was possible to get the CRV transferred to this lot so we could drive both them one right behind the other giving us a more accurate feeling for the two cars. He said that he could so we told him we’d return on Friday to try both of the cars out. Our next two stops were the Honda dealer and the Jeep dealer. We saw a nice CRV at the Honda dealership and thought we’d also return there on Friday. And then we went to the Jeep dealership where I found my car. It was a white Jeep Cherokee Limited with every bell and whistle that I wanted. We didn’t test drive the car since by that time the 5:00 traffic was in full swing but we said we’d be back on Friday. After returning home I hit the computer and found out that a Jeep Cherokee had to have Active Drive II in order to be towed. We also found out that there aren’t many of those around. Both Jerry and I searched the web for hours and hours and then I finally took over. We didn’t see any descriptions that listed Active Drive II but if we looked at the gear shift (if there was a picture) we could see if it had a neutral button there which indicated it had the Active Drive II. Can you even imagine how many pictures I looked at stretching them as best I could to get a clearer picture? I found out later that there is a tag on the back of the car stating Active Drive II. That surely would have made things easier. In searching I put in a filter of 400 miles so we were contacting dealerships as far away as New Jersey and Pennsylvania with no luck in finding the right car. We were receiving e-mails and calls quite frequently but either the car didn’t have Active Drive II or they didn’t know what it was. Jerry finally called Jeep headquarters asking what Jeeps could be towed. The lady put Jerry on hold for about five minutes and then came back on and said that the only Jeep that could be flat towed was a Grand Cherokee. Wrong answer! Thursday we headed out again and ended up at a dealership in Wilson, NC. Although they did not have a Jeep with Active Drive II anywhere in their network he knew what it was and was eager to help find one though it would probably take time. We then went to the Honda dealership right across the highway and looked at a CRV. Interestingly enough Honda quit making CRV’s that could be flat towed after 2014 so that limited our selection as well. I didn’t really like the CRV. I should never have seen the white Jeep in Raleigh! On the way back home we stopped at the grocery store and Jerry went in while I sat in the car using the iPad to continue my search and voila – I found a silver jeep with the neutral button and it was in North Carolina! I can’t tell you how excited I was. We called the dealer and made arrangements to go up on Friday. A bit later I found a red one with the neutral button at AutoNation in Johnson City, Tennessee. Oh boy, we had two to look at! We got up early Friday morning and our search began. On the way to Gastonia to see the first car I called the dealership in Johnson City and made an appointment for that afternoon. In the meantime I found one at the Mercedes dealership in Charlotte which was only about 45 minutes from Gastonia and it was white, fully equipped just like I wanted. Hot dog, three birds with one stone. We soon got a call from the Charlotte dealership telling us that the car was actually in Birmingham, Alabama and they couldn’t transfer it unless we bought it first. I know in these days and times a lot of people buy cars sight unseen but not us so we nixed the idea of Charlotte. Upon arriving in Gastonia we immediately saw the Jeep and yes, it had Active Drive II. It was a nice car but it had two things going against it. One, it was four cylinder and two, it was silver. Guess what color our Forerunner is. Don’t think I want two silver cars but we’ll see. They made us a terrific offer but we told them we were going to Johnson City to look at another one and would let them know what we decided. On the way to Johnson City I continued to search the web and found a white jeep at a dealership in Charleston, SC. I called and although the Jeep was indeed in Birmingham they would transfer it to Charleston without us having to first purchase it. Things were looking up. A bit later though we received another call from the Charleston dealership saying that the lady who told us we would not have to pre-purchase was “dead wrong” and since it was transferring from one state to another we would have to buy it sight unseen. Nope, not for us. Obviously we were willing to travel to get the right car but when I looked up the distance to Birmingham from Kinston it was 660 miles and too far for us so no white Jeep in the picture. Johnson City is not as far as one would think as it’s not far from the North Carolina border. In fact on the way we passed several places that we had visited two years ago when touring the North Carolina mountains. Not a very good picture but won’t Jerry love going to the State games driving this? 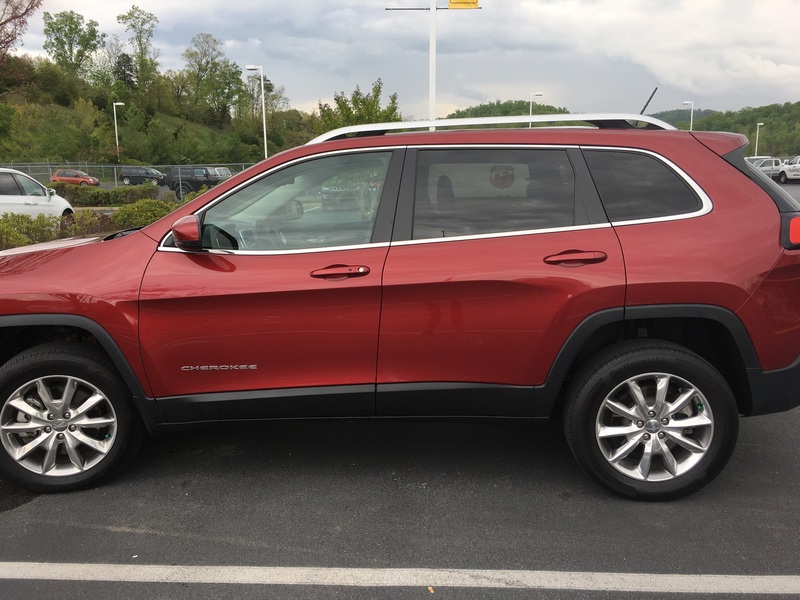 Just to make a very long story a bit shorter – we bought the red Cherokee. Jerry has always wanted a red car and though white would have been my first choice red is fine and heck, I’ll be inside! We will pick the car up next Friday. In the meantime they will have a tow package and a Blue Ox Tow package installed. All we will have to do is get the brake system installed and we’ll be ready to travel again! We finally left the dealership around 7:00 knowing we had at least five hours of travel ahead. Unfortunately we ran into the heaviest rain we’ve ever been in. In fact in all the years of marriage I have never know Jerry to pull over but he finally did along with several other cars. It was a treacherous and long drive home. Although the heaviest rain lightened it rained all the way home. Our house was a pretty sight to see at 1:30 am! And just think we get to go back next Friday to pick it up. Hopefully it’ll be a sun shiny day!